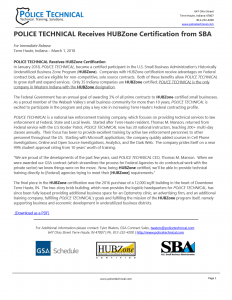 Terre Haute, IN, U.S – In January 2018, POLICE TECHNICAL, became a certified participant in the U.S. Small Business Administration’s Historically Underutilized Business Zone Program (HUBZone). Companies with HUBZone certification receive advantages on Federal contract bids, and are eligible for non-competitive, sole source contracts. Both of these benefits allow POLICE TECHNICAL to grow staff and expand services. Only 35 Indiana companies are HUBZone certified; POLICE TECHNICAL is the only company in Western Indiana with the HUBZone designation. The Federal Government has an annual goal of awarding 3% of all prime contracts to HUBZone-certified small businesses. As a proud member of the Wabash Valley’s small business community for more than 10 years, POLICE TECHNICAL is excited to participate in the program and play a key role in increasing Terre Haute’s Federal contracting profile. POLICE TECHNICAL is a national law enforcement training company, which focuses on providing technical services to law enforcement at Federal, State and Local levels. Started after Terre Haute resident, Thomas M. Manson, returned from Federal service with the U.S Border Patrol, POLICE TECHNICAL now has 20 national instructors, teaching 200+ multi-day classes annually. Their focus has been to provide excellent training by active law enforcement personnel, to other personnel throughout the US. Starting with Microsoft applications, the company quickly added courses in Cell Phone Investigations, Online and Open Source Investigations, Analytics, and the Dark Web. The company prides itself on a near 99% student approval rating from 10 years’ worth of training. The final piece in the HUBZone certification was the 2016 purchase of a 12,000 sq/ft building in the heart of Downtown Terre Haute, IN. The two-story brick building, which now provides the logistic headquarters for POLICE TECHNICAL, has since been fully leased providing additional business space for an Optometry clinic, an advertising firm, and an additional training company, fulfilling POLICE TECHNICAL’s goals and fulfilling the mission of the HUBZone program itself, namely supporting business and economic development in underutilized business districts. POLICE TECHNICAL is a national law enforcement training company located in Terre Haute, Ind. The company currently employs 21 instructors, who teach and maintain 25 courses in five certification tracks. For more information, visit https://www.policetechnical.com/gsa. POLICE TECHNICAL is the only Indiana-based company on the GSA Schedule 84|426 6, GSA contract award # GSO7F146DA.